Our Colorado Alpine Camp athletes have made it out west! The athletes and coaches packed up and left at 4am on Saturday! They had a smooth travel day and made it through the airports with all of their gear! They began their first skiing day bright and early on Sunday. The athletes began their day with a morning jog to the Woodward building for a warmup while Coach Jet even made some delicious breakfast sandwiches. Then everyone packed in and headed to Arapahoe Basin in a snowstorm, which had them grinning from ear to ear! The coaches got the kids to the mountain safe and sound in the snow. Then the skiing began! The skiing was really nice and the surface was awesome. However, they weren’t the only ones with the ski bug and the lift lines were pretty long. That being said, it worked out well for first the day on snow. Everyone got in enough runs to empty the tank. All the kids were skiing short swing Sl turns on GS skis; a real challenge but one that will pay off. 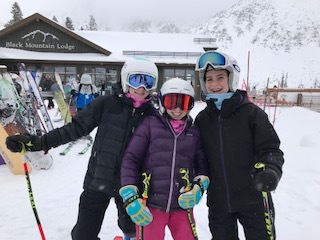 John and Ryan worked on rolling ankles and femur rotation, Merina was focused on skiing in a balanced position, and Abby, Kiera and Henry challenged themselves by skiing several runs on one ski. After training, the kids went out to dinner, tuned their skis, and had study hall. The student-athletes show their dedication with these long days and everyone was certainly ready for bed! 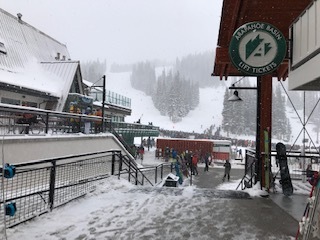 Arapahoe Basin got another 8-12 inches of snow last night and the kids are ready to go again today!